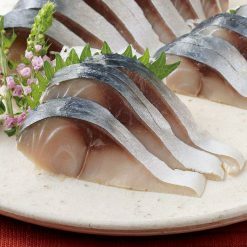 Shimesaba, or cured mackerel, is a mackerel fillet that is used for sashimi (thinly sliced fresh or raw fish) as well as a sushi topping. Shimesaba is marinated in salt and rice wine vinegar. Product totals 125g (per 1 serving). This dish is made of Japanese domestic mackerel. With very little fat on the fish, it is healthy and tasty. The mackerel was cured in a seasoned vinegar, flavored with kelp (see the list of ingredients). The scale, skin, and bones of the fish have been removed. This “Shimesaba” cured mackerel has a very subtle and mellow taste. Try it as a side or in your sushi. Mackerel is an excellent source of protein, omega -3 fatty acids and various other important vitamins and minerals. While mackerel is a saltwater fish in the same family as bonito and tuna, its flesh is a darker color (less white). Mackerel is almost always in season, due to its abundance globally (the seasons in which mackerel fish are seasonal differ from region to region, making it readily accessible). Shimesaba can be served with some dipping sauce. While soy sauce on its own is sufficient, due to the shimesaba’s strong, oily taste, some lemon added to the soy sauce (half and half) can make the dish more delightful. 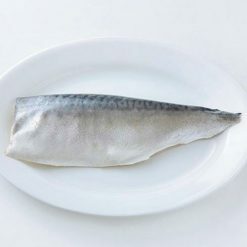 Due to its nutritiousness, shimesaba mackerel is a much healthier alternative to the usual drinking snacks, as a tapas. May also be enjoyed with rice, vegetables, and grated ginger. Thaw in the refrigerator or under running water. Please thaw the dish in the refrigerator overnight in its bag. If in a hurry, simply thaw the fish by placing its bag under running water in the sink. This product contains mackerel (Japan), malt wine/brewing vinegar, salt, sugar, kelp, yeast extract, fish sauce (this product contains fish). This product is not suitable for anyone with allergies to mackerel and may be cross-contaminated with other allergens. Origin of ingredients: mackerel (Japan). Prepared and packaged in Japan.